This is the first a few pre-scheduled posts to appear while my family and I are road tripping through the Yukon and Alaska. "Et Tu Bruté" comes from Whitehorse resident Jerome Stueart and tells the story of Shelly, a gorilla researcher who has recently broken up with her boyfriend Pete. 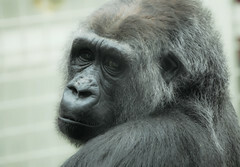 Complicating matters is Brutus, a gorilla who had taken such a liking to Pete that he's been completely despondent in Pete's absence. Shelly's fellow primatologists pressure her into inviting Pete back for a visit, as they've all become quite fascinated by primate grief. At the crux of this very short, drily humourous story is the awkward position Shelly finds herself in. Clearly she isn't entirely over Pete, despite saying at the beginning that she has "gotten used to" the idea that he is not returning. Despite the sympathy we as readers might feel for Shelly— especially as her co-workers don't seem to have any— the story is wickedly amusing.